Register for a first order discount to buy this for just £55.25, saving £9.75. 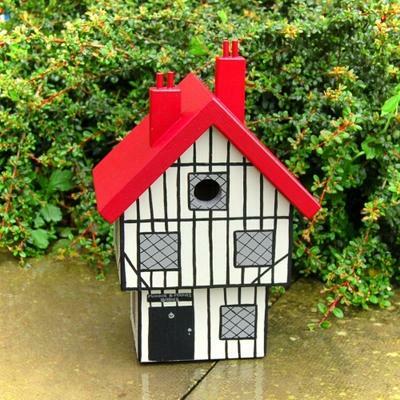 This Tudor House bird box full of the traditional quirks of a real Tudor building is a grade one listed gift for any garden but without the cost of maintenance. 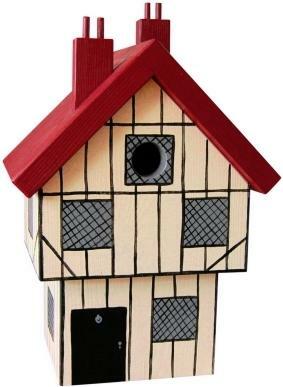 Perfect for those lovers of exposed beams, This bird box is ideal as a house warming, wedding, birthday gift, Mothers or Fathers day. Whatever the occasion may be with its timeless style this is one house that will certainly turn heads. 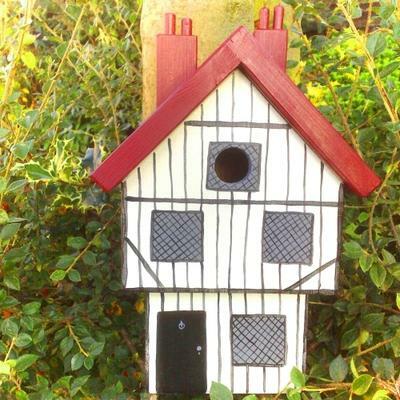 The Tudor House measures approximately 36cm (h) x 20cm (w) x 16cm (d) and can be personalised with up to 12 characters on a plaque above the door making the bird box even more special. We'll contact you by email after you place your order for personalisation details. The personalised Tudor house bird box is carefully handmade, by us here at Lindleywood, from high-grade sustainable European redwood pine supplied by a small local woodmerchant. It is then hand-painted with water-based wood paints suitable for exterior use. These paints, by Little Greene, a small independent British manufacturer from the northwest of England (who have been creating paints since 1773), enable us to create beautiful products that are non-toxic to plants and wildlife. Please be aware that each item is individually handmade and hand-painted to order so one item will differ slightly from another and may not appear exactly as in the photographs of other products. This means that each product is entirely unique and extremely individual! Also note that as we make each item from wood there may some variation in grain. Over time there may also be movement in joints and surfaces. This is down to the nature of ‘real wood' as opposed to synthetic materials and we feel further adds to the individuality of each product. All items are individually handmade and personalised to order by us in the UK, delivery will be by courier and will require a signature. This item is sold and dispatched directly by Lindleywood. Simon and Helen Lindley, the founders of Lindleywood, know the importance of teamwork after being together for over 20 years. They started by making gifts for family and friends, then developed this into Lindleywood. Based in Lincolnshire, they design, make and paint original, high quality products that will complement the style of your garden.